Pictured, Davenport, Iowa, Walcott Elementary elementary school teacher, Megan Luloff in blackface. Megan Luloff-Davenport, Iowa, Walcott Elementary elementary school teacher pictured in blackface issues apology after viral photo: ‘I didn’t know any better.’ But will it save her job? 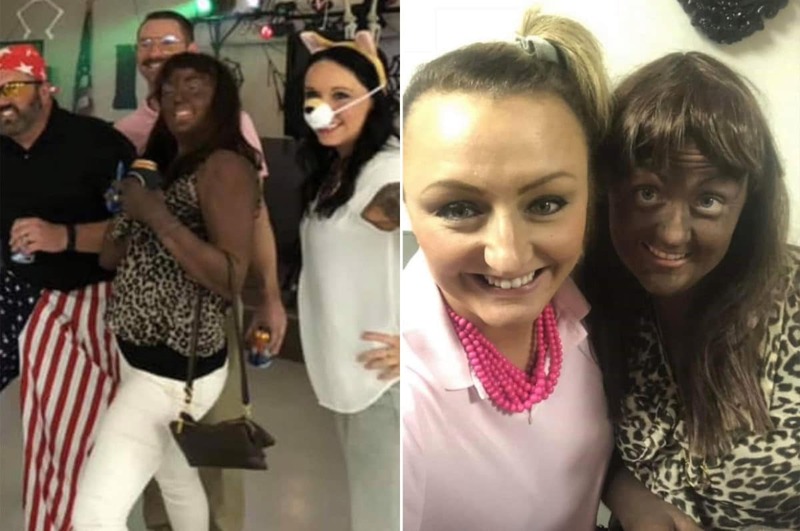 A Davenport elementary school teacher in Iowa photographed in blackface at a Halloween party has issued an apology claiming that she never knew the disparaging act of white individuals dressing up in black paint stemming from a controversial and demanding chapter of American history. To boot- the teacher insists she never meant to offend anyone. Luloff as part of her costume dressed as Lafawnduh, Kip Dynamite’s wife. The photo unwittingly led to Luloff being the focus of an investigation upon school district officials being made of the contentious costume. Come Wednesday the nypost reported an attorney for Luloff releasing a statement saying the elementary teacher was ‘completely unaware’ of what blackface represented in American culture. The attorney added that Luloff would never have knowingly mocked people of a different race because her child is an albino. Luloff, according to the statement, is no stranger to how ‘sensitive feelings about appearance can be’ as the mother of a child of albinism. Will Megan Luloff still get to keep her job as the world demands she is fired? While continuing, ‘after learning about the term, however, our client immediately understood the anger and outrage behind the photo,’ which have including calls for her firing by local NAACP officials. Luloff according to her attorneys then took part in the district’s ongoing investigation into the photo. Luloff the apology noted will be ‘eternally sorry for her lapse in judgment’. Welcome to a bold divided America-oblivious, ignorant to its sordid history, conflicted identity and at war with itself while nonchalantly celebrating wider pop culture which could only exist with the overwhelming participation of African America suffering and import….and artistic merriment. Of note, the teacher’s employment status wasn’t immediately clear…..